Wooter is a management platform for leagues, tournaments, teams and coaches that enables organizations to manage leagues and players, and create a custom league website and mobile app for Android and iOS. The platform enables organizations to manage registrations, players, teams, and schedules, and provide games stats and videos along with features for chat and messaging. Players can get their own player profiles and view team pages, season averages, leaderboards, rankings, and more via mobile device. 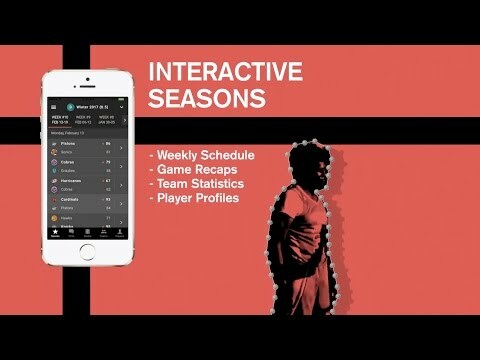 Wooter provides a full display of each player’s and team's stats for every game. Users can track the season’s schedule and view scoreboards, as well as all standings and rankings for players and teams in every division. Commissioners are able to send messages to the entire league, and team members can communicate with each other via private chat rooms. Each team and player are provided with their own team and individual player profiles which include their history, stats and media (videos and photos). All users are able to upload photos and videos to a feed, directly from their mobile device. Wooter enables full visual customization of the league's website and Android / iOS mobile app through optional features for custom branding and domains. Additional features allow organizations to send broadcast messages and notifications to users about upcoming games and news, and enable administrators to set user permissions for access control. Wooter offers various commission incentives including an apparel fan shop, an advertising network, and registration fees. We used the Wooter app to create our 3 on 3 basketball league. Customer service was excellent. They would always personally cater to us when we had issues. Time zones seemed to be an issue on game start times. App was buggy. But to be fair, this was over a year ago when last used by me. Wooter Sports Platform helps me organize events much more effectively than using a group chat or a newsletter among the work space, and the benefits of being able to directly communicate with everyone all at once and organize efficiently is very attractive to people looking for a service like this.The software was extremely well done and well cared for, there was visible effort put into the coding and the time it took to create this was evidently long. The software was extremely well done and well cared for, there was visible effort put into the coding and the time it took to create this was evidently long. I had no problems using this, but maybe a button in the settings thats a direct line to a customer support service? for if something isn't working properly? Editing became more of a hassle and time consuming than other options, so stopped usingCan be accessed by team/league members, so this makes it a great option to potentially save time. Can be accessed by team/league members, so this makes it a great option to potentially save time. Thanks for the review Lynn. Editing has been always a big issue for us since the option to edit such a big number of stats for a game was a big challenge. To avoid the need of having to make an edit for stats from the website, we decided to make the Wooter Stats Tracking App. This app makes the add/edit/delete of stats a breeze, fun and best of all, Real-Time! Order time, I wish it was a little faster on turn around but the quality is worth the wait. I also wish their was a way to add uniform packages in the team store. It would save a lot more time and allow more of pur athletes to order more gear. Thank you for the review Sriragesh. We are working to improve the experience ever time. If you have any ideas about improvements we are happy to hear. The Wooter platform offers a web-based and mobile experience for sports leagues and players with features for online registration management, scheduling, and more. Wooter allows organizations to create a custom website and iOS / Android mobile app for their league, team or tournament. Communicate and chat with the team and other players in the league via messaging and private chat rooms. With Wooter, players can see their schedule, scoreboards, stats, media, and standings/rankings straight from their mobile device. Users can relive games and tournaments with access to videos, photos and news, updated every day. Below are some frequently asked questions for Wooter. Q. What type of pricing plans does Wooter offer? Q. Who are the typical users of Wooter? Q. What languages does Wooter support? Q. Does Wooter support mobile devices? Q. Does Wooter offer an API? No, Wooter does not have an API available. Q. What other apps does Wooter integrate with? Q. What level of support does Wooter offer?